Hello again, today is once again my day to post on the Victorine Originals blog! 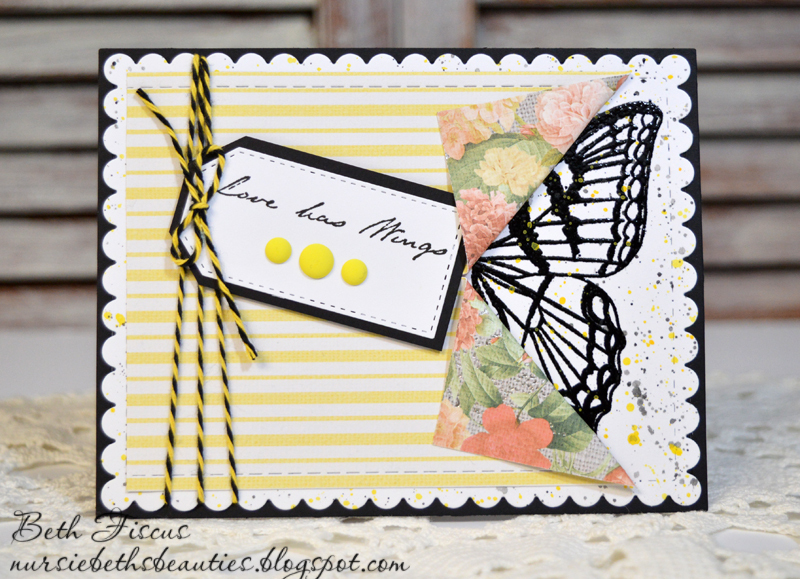 Two weeks ago I shared THIS butterfly card with you, and today is another butterfly card, but with an entirely different feel to it! I started with a piece of white cardstock and stamped and embossed the gorgeous butterfly wing from the V.O. Wings Stamp Set. 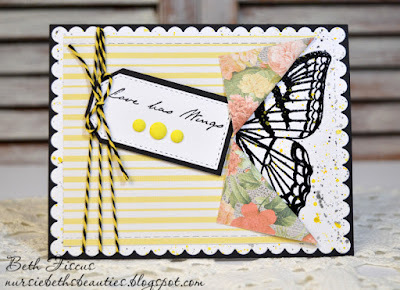 Then I watered down black and yellow acrylic paint to splatter it over the white cardstock. After that I die cut it with a GMD Scalloped Stitched Rectangle die. The patterned paper is from DCWV's Country Floral stack and I die cut that with a GMD stitched rectangle die and cut a slit partway across from the right side to show the wing stamp. To dress up the rest of the front I added Bumblebee Trendy Twine and an unbranded tag die cut. 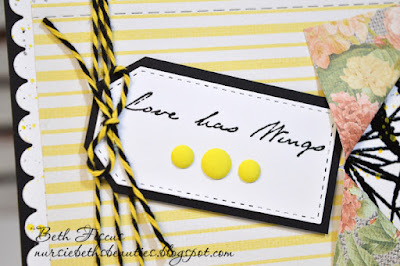 I stamped a sentiment from the Wings Stamp Set and added three matte finish yellow enamel dots. Are you ready to see ALL the awesomeness of the stamp set I used? Here it is! Yes, it is a huge set and oh-so-beautiful. It measures approximately 8x8". Very pretty! I love butterflies. The splattered paint adds a nice touch to the white background. Such a pretty card! 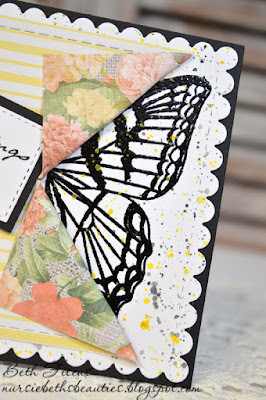 I love all of the different techniques you used with the embossing and pain splatter! The twine accents look so amazing too! This is just sooo PRETTY! LOVE the butterfly! Beautiful card!